The origin of the Japanese Spitz is said to be the white German Spitz brought to Japan around 1920 and exhibited at a dog show in Tokyo in 1921. 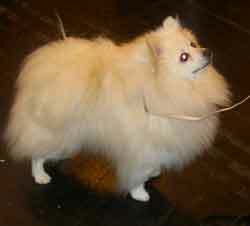 In 1925, tow pairs of white Spitz were imported from Canada and further pairs from Australia, USA and China until 1936. Eventually the off spring from these dogs were cross bred to produce the current breed. After the 2nd World War, the unified breed standard was established by the Japan Kennel Club in 1948 to be valid to the present.These dogs are alert, intelligent, affectionate and make good companions, although can be wary of strangers.